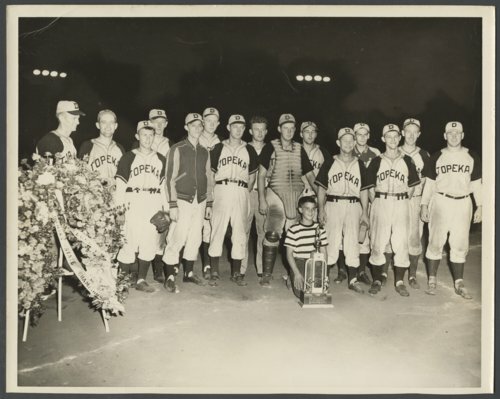 The Topeka Decker Oilers are pictured here after winning the championship baseball game at the state semi-pro baseball tournament in Wichita on July 29, 1948. The Decker Oilers defeated the Boeing Bombers, 2-1, to claim the title. Pitcher Junior Coffman (fifth from the left, wearing a jacket) was named the tournament's most valuable player, winning four of the five tournament games in which he received a decision. He also was named the tournament's leading pitcher. His brother Ed Coffman (third from the right) was named the tournament's leading outfielder. Shortstop Don Kirkwood (on the far left) received a sportsmanship award. Others in the photograph who have been identified include: first baseman Butch Nixon (second from the left); catcher Fritz Brown (wearing catcher's gear) and his brother Justin Brown (front row, third from the left); and manager Vern Coffman (in the front row, to the right of Fritz Brown). During the late 1940s and 1950s, the Decker Oilers team was a perennial contender for the state semi-pro title, competing each year in the state tournament. In addition to winning the championship in 1948, the Decker Oilers placed second in three consecutive years (1950-1952) and finished third in 1955 and 1957. Digital reproduction of the photograph was accomplished through a joint project sponsored by the Kansas Historical Society and the Shawnee County Baseball Hall of Fame.